Irita Beach (入田浜) is one of the popular beaches in Izu Peninsula. It has beautiful white sand with green ocean. 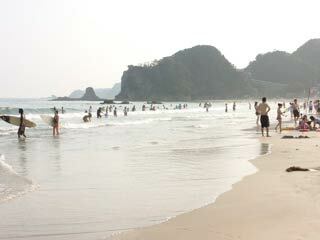 In summer, many people visit this beach and enjoy seaside activities. The white sands, green water, and tropical trees offers visitors the atmosphere of southern islands. There are parking, public shower and restroom, and lots of rental equipments, such as body boards, umbrella. Good spot for family activities and dating.